Total: 1 hr 20 Min. | Active: 50 Min. Combine the soy sauce, oil, cane sugar and garlic in a bowl. Add the meat, mix, cover and marinate for approx. 30 mins. Heat the oil in a non-stick frying pan. Stir fry the meat for approx. 5 mins., remove. In a small bowl, mix the sesame with all the other ingredients up to and including the garlic. Rinse the rice in a sieve under cold running water until the water runs clear, then drain well. Bring the water and rice to the boil, cover the rice and simmer over a low heat for approx. 10 mins., turn off the heat and leave the rice to fluff up in the covered pan for approx. 10 mins. Separate the rice with a fork, mix with half of the sauce. Heat a dash of oil in a frying pan. Stir fry the pak choi, carrots, mushrooms and bean sprouts in batches for approx. 5 mins. each, remove from the pan and season with salt. Heat the oil in a non-stick frying pan. Crack open the eggs, slide them carefully into the frying pan one at a time. Fry over a low heat until the egg whites are set but the yolks are still runny, season. 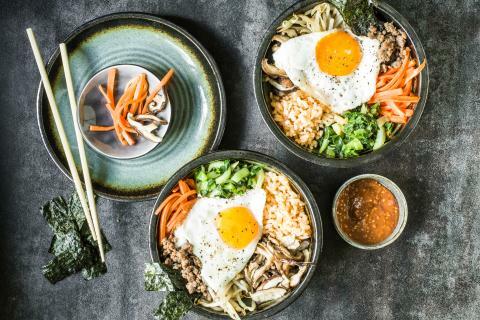 Serve the meat, rice, vegetables and fried eggs in a bowl. Top with the nori strips and serve with the remainder of the sauce. Gochujang is a Korean chili paste. It can be purchased in big supermarkets of Coop or Asian food stores. Gochujang can be substituted with 3 tbsp. of miso paste and 2 1/2 tbsp. of sriracha sauce.